Rising summer temperatures lead to an increase in your lawn and landscape plants’ moisture needs. If rainfall is scarce this summer, your turf, trees and shrubs will really be counting on you to step in with some supplemental watering. It’s a common misconception that light, frequent watering is beneficial. Actually, this does more harm than good by encouraging shallow root systems that dry out too quickly. What you want to do is cultivate deeper, more extensive roots. The way to do that is to water less often, but more deeply. 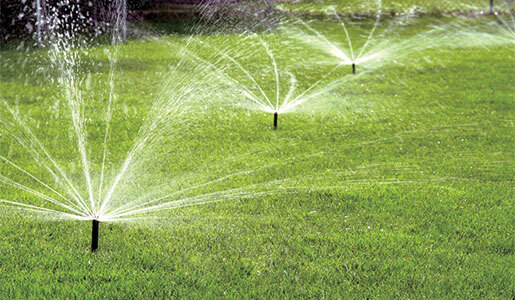 Your lawn needs from 1″ to 1.5″ of water per week from rainfall or sprinkling. If there’s no rain in the forecast, a long, deep soaking once per week will do (letting moisture penetrate 6″ to 8″ into the soil). Your trees and shrubs will also benefit from a deep weekly soaking in hot, dry weather. To keep them sufficiently hydrated, you should water them three times as long as you water your turf. 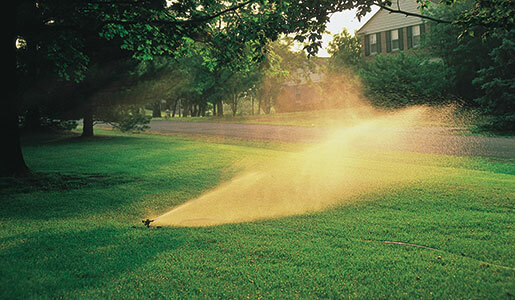 Watering early in the morning helps to avoid evaporation from wind and the sun’s heat. You can further improve watering efficiency by keeping sprinklers from hitting sidewalks and driveways. • Timers that limit watering to the cooler parts of the day. • Independent station programming to provide certain parts of your landscape with more water than others (depending on plants’ individual moisture needs). • Rain shut-off devices to prevent wasteful watering when it’s raining. • Soil moisture sensors to override irrigation when enough water is present in the soil. Whether you choose the hands-on approach or let an automatic system do the watering for you, you’ll be making a big difference in the health and beauty of your lawn, trees and shrubs! Please Note: If watering restrictions are in place, we encourage you to follow your county’s guidelines for water conservation, watering your lawn, trees and shrubs whenever you can.